Who may find the book useful? I wrote it primarily for my fellow Massachusetts lawyers, and it focuses on the Massachusetts precedents. But most of the topics are national and may be of interest to US lawyers who handle civil litigation with transnational issues. 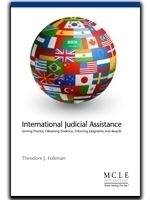 The book may also be useful to lawyers abroad who want to know more about how the United States handles international judicial assistance issues. And although it is not meant as a scholarly treatise, I hope that my colleagues in the law blogging world and in the academy will take a look. You can buy the book from MCLE at its website. 1 Check it out!